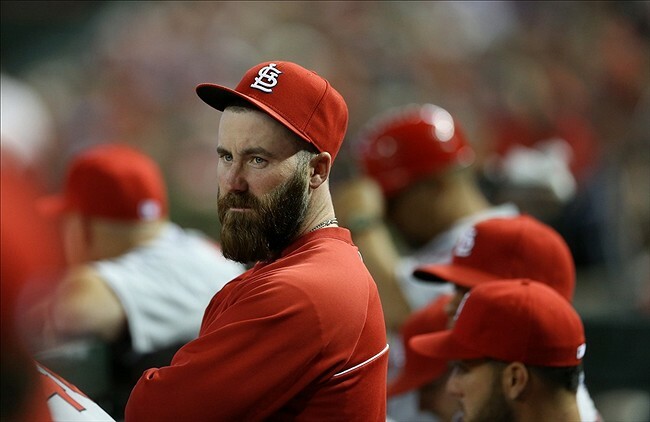 By signing with the Chicago Cubs, Jason Motte gets the best of both worlds. He gets to compete for a potential winning franchise and stay very close to his favorite city of St. Louis at the same time. Be happy for the guy. Upon hearing the news this afternoon, Cardinal fans were either hurt or mad at Motte for accepting an invitation to the Little Bears club. I don’t get the frustration. When a team rebuilding quite nicely like the Cubs come calling with a reported 4.5 million dollar offer with incentives, how can an aging pitcher say no exactly? How does that work? Motte is 32 years old, went through Tommy John and other injuries, and is starting his trek down the hill instead of up. Translation: He is getting old and his arm is being accompanied by new warning labels every season. This is a good deal for him. He wasn’t coming back to St. Louis. There is simply zero room for him in that crowded young bullpen. He could have gone farther away, but I like that he stayed close. Call me sentimental or carefree. Just keep reading. As I have said with the Cubs recent surge back from the Walking Dead territory, this is good for the division and the rivalry. Cardinal players have been going over to Chicago for a long time now. Jim Edmonds went to Chicago and cranked a few off the Cards in Wrigley. What’s so wrong with Motte firing some fastballs for them this coming season? Let’s see if he gets his career back on track. For one more season, Motte won’t have to face the dying of the light in his Major League Baseball career. I like this deal and so should any Cards fan or lover of the game. He is going up north a bit, but will still be close. He will come back and play against us. If he is the 2012 version, the challenge will be there for the Cards hitters to take their best shot at Motte’s high octane heater. If the Birds get the 2014 version, it will be batting practice all over again. A flashback to Esteban Yan in his prime. This isn’t a win/win for the Cards, but it’s a chance to face an old friend and keep him close to the city that he produced so much for over the course of the past 4-5 seasons. Forget baseball for a minute and think about the efforts of Motte in the community, raising awareness for Cancer and starting a league wide charity organization to raise money. That will still be based in St. Louis. Motte’s efforts to combat a deadly disease started in the Lou and will remain there no matter which uniform he puts on. It may give him the chance to wear a different color “K Cancer” shirt but that is okay. As long as money is being raised, wear whichever shirt is in front of you. There should have been signs last year in a random pic where Motte was wearing the Cubs Blue version of the shirt. It’s hard to act shocked at the Motte/Cubs connection. The Cubs loaded their bullpen with hard throwers back in the day when the Cards has Tony Fossas and Jeff Brantley firing flat heat in the late innings. The Cubs have always loved a good side of no nonsense velocity in their bullpen. Motte fits their style and will get a shot to close or set up. The hardest thing for fans to do in sports is separate the romantic urges of the game from the business tactics. At the end of the day, the business side always wins. Players come, make a mark or fall flat, before moving on. As a good friend of mine frequently sums it up, it is what it is. Jason Motte is a Cub. Be happy for him today. There isn’t a classier guy in the game of baseball than Jason “Wolf Man” Motte. I will miss his mound mannerisms. Taking the hat off several times. Rubbing his scalp. Shouting into his glove. The way as he came set to pitch it felt like a shotgun was being aimed at the plate. I’ll never forget Yadi Molina tackling him after the Cards won their 11th World Championship in 2011. When April comes around, business will reign supreme and it will be time for the Cards to take Motte deep at Wrigley. The Cards and Cubs meet first in 2015. This just made it even more interesting to watch. Thanks for reading and find more of my instant take right here.